Keep yourself centered and grounded and do not allow anything to divert or distract you from your mission or Ascension. Every day remind yourself of your purpose as a Starseed/Lightworker. One step to take towards this path is to learn and be totally aware of everything you do from moment to moment. This means your every thought, word, attitude and action is of great importance. Through this exercise, you will then see that “time” as you have been taught to know is just an illusion. That is 5D knowing. This is a process of bridging 3-4D thinking to 5D knowing. This is part of the path to enlightenment. Also, know, that you don’t have to wait for the Galactic Wave of Love Awakening to occur to reach enlightenment. You can have full consciousness and full awakening in the present if your desire is strong enough and focused to do the work(joy) to achieve this. What is on many people’s minds? Yes, it is still the big question of where is your blessings. Each of you beloveds have been waiting for prosperity (your RV), GESARA, NESARA, world peace, joy and harmony besides perfect health and great abundance. We tell you again that all is transpiring as we speak. Know however, that absolutely, you have an enormous role in the manifestation of these great events. Everything starts with you. Step back a moment and reflect to yourself the following. “What have I done to assist in bringing these many blessings to reality. Your part in staying on course is to keep raising your vibrational frequencies and consciousness levels. Remember that each of you and what you think, allow or do counts greatly in affecting your Collective Consciousness. On a daily basis, schedule a portion of your existence to devote in silence and go within. The practice of meditation is the way to connect with your Higher Self (God-Goddess Self). The more you meditate, the more enlightened you are to being fully Awakened in the knowing that you are full 5th dimensional Galactic beings and fully realized Gods and Goddesses. Know that you are the Masters, Creators, Inventors etc. who have come from many different parts of the Galaxies and Universe and now is your moment in this existence to complete your journey of assisting in the Ascension of Terra Christa and all upon her. WE ARE ONE and it is the NOW, the Moment that you have been waiting for! 516-418-5563 and press 1 if you would like to speak. Today’s call will be wonderful as it is full of information and lots of Love vibrations! We are starting early since we have much to cover. Zorra starts off the show with the updates. He will be followed by 2 special guests who will share the importance of health and wellness by providing us information about New seed products by Rain Intl. They are Dr. Christina Cook and and Russ Cowley, VP. Then we have asked Dr. Russell Johnson to speak briefly about the how to form non-profit organizations and or foundations to help you in preparation for the RV etc. What a wondrous, glorious and loving NOW, it is! Hollow Earth Network – IS THIS OUR LAST CONFERENCE CALL? – WHY? Throw open the Doors to our Blessing! We call for our Abundance now! We call for our New Governance now! We call for our new Financial System now! We call for our Reunion with our Galactic brothers and sisters… our Galactic Families… NOW! We initiate this call to action from our incarnate presence within the current dimension of Beloved Terra. Light, with full enjoyment and completion of their original Loving Missions. Your Loving Children of Light, incarnate on Planet Earth – joyfully receiving our Blessings of Abundance, Honorable Government, Financial Freedom, and Joyous Reunion with our Galactic Families. On the eve of the New Moon in Sagittarius, the Wisdom Goddess Kamala draws aside two veils that closed the entrance to a sacred pathway. This is the second time this month that she has invited us into new levels of consciousness and experience. She opens deeper possibilities and opportunities. Today she asks that we walk into tomorrow’s new lunar month (and all of the possibilities opportunities it will bring) with renewed vitality. She asks that we walk through the entrance to the next month with restored passion for pursuing what makes our hearts sing. She asks that we remember. She asks that we maintain the spirit of boldly going forward toward our destiny. But today’s energy can also go crazy. The Sun is located at a degree that brings out madness. It also brings out immaturity, the need to be the center of attention, and the desire to overindulge. On the higher octave, beautiful forms can be made – forms of anything. Connecting with what is real and immediate is a pervasive intention, but today it is even more important. Nature is always the primary source for what is real and immediate, but there are also people, places, and things that are real and immediate for us. We want to stay on track with what is truly valuable to us. Finally, messages are falling down like leaves. They are marking the way to the sacred pathway that Kamala is opening for each of us. Be open to receiving them. Join us on Ciracle Radio Station, T-O-D-A-Y 1 PM MST, 3 PM EST, 7 PM London and 9 PM Israel time for a 60 minute broadcast full of energy of our animal guides and this time we will have Brock Foster, our Ciracle member as a guest and he will join us to welcome the animal guides. We invite listeners to come and participate in the discussion and sharing of knowledge. And we thank all our listeners for truly “being” the shows we air. Disclosure Now – On The Enlightenment Evolution Network. 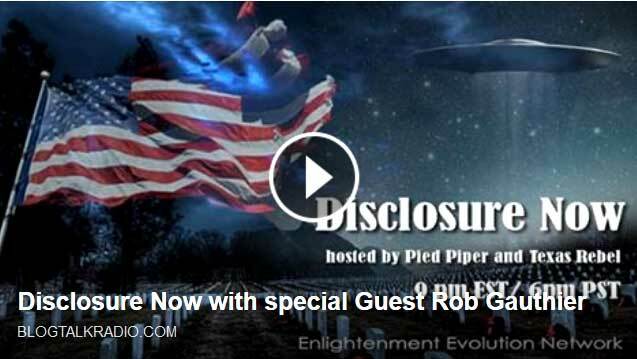 10/18/2014..Rob Gauthier – Channeler will be the VERY FIRST guest on the one and only brand new show… Disclosure Now. On The Enlightenment Evolution Network. On Saturday evenings at 9pm EST and 6 pm PST The Pied Piper and Texas Rebel will be hosting the Disclosure Now. Disclosure Now is the “on the edge of our seats” show that covers all topics of disclosure! From the worlds most famous, and obscure UFO cases, to cryptozoology, conspiracies, and all things that go bump in the night. Pied piper started his journey in Michigan in 1993 at a preteen seeing a Bigfoot, and never could get enough in investigating all things paranormal. Texas Rebel is a wild Texas Man who LOVES this same journey and has studied these same things for years. Join us as we cover all things in the human experience that just can not be answered by anyone. Listen here and call in at (347) 215-8586. ZORRA/FATHER GOD’S CALL TODAY, OCTOBER 8, 2014!